Unravel this creepy-crawly Match-3 adventure and unveil haunted castles that will leave your spine tingling! Explore vast levels at your own pace with one of three modes to fit your play style, and buy upgrades from the sinister shop to aid you in your travels. Play minigames including hidden object and mahjong to earn bonus money and unlock spooky decorations for each eerie scene! Jewel Match: Twilight is rated 4.9 out of 5 by 46. Rated 5 out of 5 by Kimmycoo from Fabulous I am totally addicted to the Jewel match games. They totally rock! So much fun, I love a game where you get something when you play it. Like in this one, as you go along beating levels you unlock wallpapers that you can actually use on your computer or mobile. Its like winning a tangible prize. I loved building each new wallpaper. Very creative, loved it. Rated 5 out of 5 by scamp69 from MY FAVORITE! Resides on my Desktop and play daily. I don't usually play Match 3 type games. And I'm also not sure if there is a special way to get the coins. BUT, I really recommend that you try this because it is pretty and FUN. Rated 5 out of 5 by pjries from Still play this. Still love it. I love this game! I still play it from time to time, and especially during the Hallowe'en season! There are shortcuts and strategies to managing the gameplay and there are several options for playing, from relaxed to timed to a limited number of moves. Each level has two or more screens and a "crypt" which you can choose to explore once you've completed the level. There's a map, if you like, to help you navigate these screens. You can also return to the completed screens and grab the power-ups or the extra coins (for buying power-ups in the "store"). I'll sometimes set a challenge of my own, like targeting all of the coins or all of the hammers. The hammers reset for each level, so best to use them. You can't take them with you! 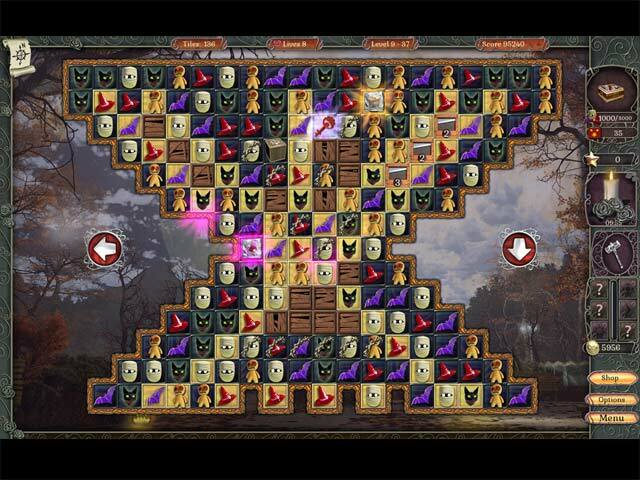 The special features that set this game apart from other match 3s are things like a fishbone "spell" that clear entire rows or columns and one that zigzags. There's an expanding box that clears all squares beneath it and blocks that require several matches around them to clear. Each time you make a match near by, you hear a click and the number on the box counts down. Some areas are covered with "smoke" which you have to clear by making matches nearby. (Here's where the map comes in handy!) Graphics are decent. I like them much better than a lot of the match 3 games. Frogs, skulls, witch's hat, Jack O'Lanterns, brooms, ghosts, etc. The music is spooky, but not annoying. There are scenes to build to complete each level, and you don't have much of a choice, but I don't play these games for those building aspects. All in all, a great game! Rated 5 out of 5 by Pz3J from Best Spooky Match 3 This is by far one of the coolest, spookiest, most "Potter-esque" match 3 ever! For that alone it gets 5 stars. 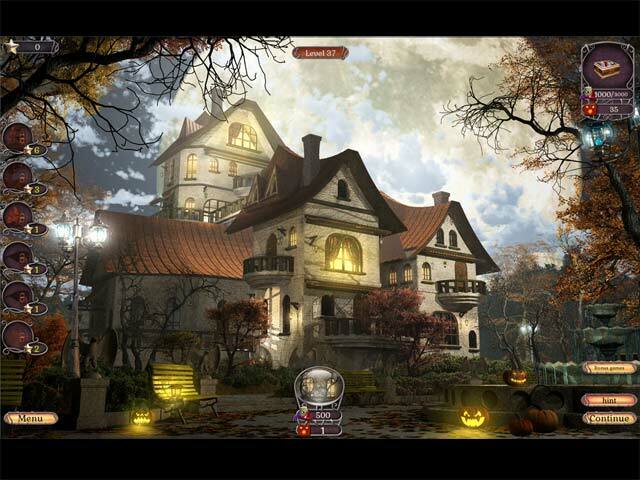 The autumnal back drops will delight your inner trick-or-treater. Gameplay is interesting with some levels containing multiple boards and unique power-ups. With your earnings you can add pieces to the backgrounds and even use them as wallpapers. The pieces you match are also pretty cool, like the pumpkins. Mark my words, I'll be playing this a lot in October, hohohoahoahahahaaa! Rated 5 out of 5 by MissV1962 from Just plain fun! For such a simple game, I am hooked! I love the Halloween icons and the sounds too! It is almost like fairy charms. The bonus games- mahjong, hidden object and a mini drop game are fun! I can play the unlocked games at any time. I can start a level and stop when I need to. The pictures you 'build' are pretty! I come back to this game over and over. I hope they make one for each holiday- I would buy them all! Rated 5 out of 5 by denniann2 from love all the games in this series!!!!!! standard M3 with the bombs, chain breakers, different levels of hammers and all the same power ups the others have. match 3 to get mana to use your power ups and collect coins to buy things. build different scenes as you go, just like the others. all of these games are beautiful. the scenes you build are gorgeous. highly recommend!!!! Rated 5 out of 5 by deddu from Hours of Fun Best Jewel match ever! The icons are very well done -- and all the bonus games are great. You can beat the clock, or play mahjong. Rated 5 out of 5 by whimbrel from My favorite Jewel Match For me, the Jewel Match series is the best, if I see a new one it's an automatic buy. I always play in relaxed mode; I'll spend a lot of time getting that last match sometimes before using the hammer or a power up, so I appreciate that option. Even though this version is seasonal, I'll be playing it many times. The scenes are always getting better! I love the ricocheting fishbone, too, that's a welcome addition. Rated 5 out of 5 by tacomataz from Love it. I have played all of the Jewel Match games and I have loved all of them. This one is one of the best when it comes to the graphics. They are awesome. The little icons that you match are really cute. I hope that there will be a Jewel Match with a Christmas theme to it. Rated 5 out of 5 by fehrplay from What is better match game? Nothing Very entertaining and addictive game.Hard to find better. Rated 5 out of 5 by Mist12 from Fav Jewel Match I don't often write reviews, but this JM is by far my favourite.Top game and one I have already started playing a second time. Enjoyed playing some of the other challenges, including the HO, but most of all, just loved the basic game. I usually like mahjong but not this one. The tiles were just too similar. But other than that quibble, the graphics were wonderful, especially the backgrounds. Rated 5 out of 5 by SynthpopAddict from Spooky beauty of a M3 [review based on completed timed mode] Pros: multiple gameplay modes, many customizable game options, minigames, long play time, beautiful HD graphics Cons: soundtrack/effects a bit monotonous, mahjong reshuffle feature a bit strange, fairly aggressively timed in timed mode The Jewel Match series gets better and better with newer releases. The developer takes care to incorporate gamers' feedback from their past games and has done an excellent job of creating a new game just in time for Halloween. 120 levels you can play extremely fast since you can make moves constantly, lots of powerups and upgrades to buy in the in-game shop. No storyline at all. 48 optional minigames [M3 bonus games, mahjong, and HO scenes] which don't break up the base game, as you don't have to click on the bonus games button if you don't wish to play the optional content. Timed, untimed limited moves, and plain relaxed modes; gorgeous game graphics and scene building elements. Most of the game elements are customizable and you can choose to play in scrolling M3 board mode or the default [mostly] static boards. I found the music and ambient effects a bit monotonous after a while, and you need very high screen resolution for the game to display well. Will confess that I beta tested this game and noticed that in the final version timed mode appears to be more aggressively timed to where it's quite the challenge if you're the sort that likes to collect everything in a level. I haven't played the limited moves mode in the final release yet, but when I was beta testing, the limited moves mode required you to think, but not frazzlingly hard as in some levels of JM2 Reloaded. I also noticed that on a couple of the mahjong minigames that the reshuffle feature doesn't necessarily work when there are very few tiles left and no more moves remaining - may be a glitch. Overall, it's a real gem of a M3 and not just for Halloween; much recommended! Rated 5 out of 5 by sabinesa from Wow, they raised the bar again What a wonderful addition to the Jewel Match series. These devs are amazing and managed to keep what makes this series so great intact while adding extra little things that are great fun, add value and make it exciting. This is how the development of sequels should be done. Hope other devs take note! Rated 5 out of 5 by intlwoman from Another great Jewel Match from Suricate Wonderful graphics, challenging puzzles you can play timed or relaxed (but with number of moves you have specified.) Just when you think you solved one puzzle, you have 2-3 more, so use your moves and power-ups wisely. Nice background music as well. If you enjoy Holiday themed you can play all year round this is one of them. You should also try Spooky Bonus, another one with great ghoulish music, graphics and fun. Love this time of year.! Rated 5 out of 5 by frankyJR from Best match3 game so far! Right from the start I loved the music and noticed the beautiful graphics. The game has some new features: there is a mini-map for guiding you through the huge levels and plenty of beautiful decorative objects to purchase and bring life into your castle scenes. The animations are great and the game feels creepy in a playful way which I enjoy and find relaxing. Rated 5 out of 5 by LittleEarth from Great halloween fun The latest installment in the JM series stays true to it's predecessors, it has big entertaining boards with lots of interactive elements, powerups and beautiful scenes to build. In addition to that, you can now buy bats, ghosts, witches and other scary things to haunt the sets. All levels have an added bonus room which unlocks if the rest is completed. There you can collect extra resources and golden stars that are used as currency for set decorations. As you progress and get higher and higher score you will unlock different minigames like race levels and hidden object scenes. The game is halloween themed but it can be enjoyed along with your children as there is no blood or gore. JMT will keep you busy for a long time. Definitely try this game! Rated 5 out of 5 by largo249 from This game is out of the park!! Been playing BFG for years and have enjoyed alot of games, but have never taken the time to write a review...........until now! This game is THE best Match 3 I've played in a long, long time. Graphics are great, music not boring or annoying and lots of play options. Regardless of the Halloween theme, I'll be playing this all year. Can't miss on this one! Rated 5 out of 5 by theredace5000 from Yay! More Jewel Match! I love getting a new Jewel Match game each year. They're so relaxing. It's like my zen game. And this one is all spooky just in time for Halloween. Each Jewel Match game gets a little better (if that's possible), and this one is no different. I love the little extra things that you can buy from the shop to add to each scene, so fun! Rated 5 out of 5 by gilly85 from Another Jewel Match classic The Halloween theme is well timed for this holiday season. The graphics, as always, are crisp and clear and the tokens move with ease. Not so many sparkles as the other Jewel Match games which suits me fine. The only thing I missed was a custom cursor but when I buy the game this will be the last thing I will worry about. I played the demo on 'Limited Moves' mode which I prefer. It gives the old brain box a workout without being hassled by timers. Excellent game - playable and challenging. Well done devs. Rated 5 out of 5 by IsisRising from Wonderful Another addition to the great line of Jewel match M3's! The graphics are great Halloween images and the gameplay is very smooth. I also liked the music and purchased this game immediately. You play regular or relaxed and there are helpful hints. Rated 5 out of 5 by arneybaby from another great jewel game I have all the jewel games and I play them over and over again. You can play in different modes I like the relaxed. I love building games and this has everything that I have been looking for in a game. It has many mini games that are a challenge as well. You do need money to buy these games so save up. Rated 5 out of 5 by a41249 from Creepy match This is another good game in the Jewel match series. You have to match the spooky Halloween characters to clear the board and earn coins to build the buildings. More interacting than some of the other Jewel games. If you click on the cats they will put their ears back , very cute. Rated 5 out of 5 by journey2 from Jewel Match Does it again! Jewel Match is the "Crown Jewel" of Match 3 games!! Yea for them, and yea for me! Rated 5 out of 5 by cowclaudia from Love this one I own most of the Jewel Match games and this to me ranks about the best. 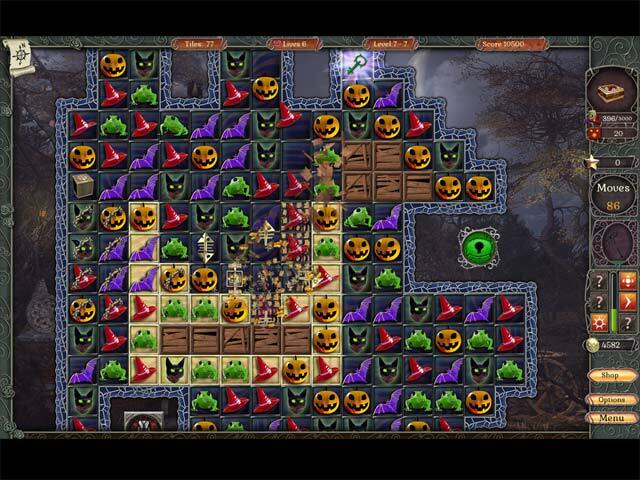 This theme came out just in time for Halloween and the tiles are pumpkins, bats, black cats, mummy heads, and the theme is haunted houses which is great. Has three different game modes, bonus games and on this one you can buy special decorations like bats, crows, etc. Really a lot of fun . Rated 5 out of 5 by pennmom36 from I THINK I LIKE THIS SERIES MORE THAN THE CRADLE SERIES Jewel Match games are quickly becoming my favorite Match 3 games, and this one is perfect for halloween. The graphics are stunning in all of the Jewel match games, and there's so much to do that it's extremely entertaining. You can play on a Timed Mode, a Limited Moves Mode or a Relaxed Mode. Each level has several "rooms" to complete, when one room is cleared, you click on the arrows to visit the next room. Most levels contain a Crypt Room where you can continue to play in a special room with your time remaining to earn stars or coins. The coins and amulets you earn are used to build your castle which can be set at anytime for your wallpaper. Stars are used to purchase extra's for your castle such as ravens to set the mood. Matches of 4 will earn you a Rainbow tile that can be matched with any tiles, matches of 5 tiles or more awards you with a Fishbone that clears rows, columns or diagonal lines. The object is to clear all gold cells by making matches over the gold cells. Some items require you to make matches under the items such as keys or amulets until they fall off the board. Coins that appear can be clicked on but they will disappear eventually, and bags of coins must be dropped off the board. Mana bottles are used to cast different spells, small mana bottles can be clicked on but large bottles must be dropped off. Some tiles are blocked with crates, chains, double chains, ice cubes, or dark fog, requiring matches next to them or of the same type of tile contained within. There are Safe Tiles that require a specific number of matches to break as displayed inside. You earn a new life every 50,000 points and are given the option to use one of your lives for extra time shortly before the timer runs out. This is a fantastic Match 3 game, enjoy! Rated 5 out of 5 by yelwbkrd35 from Super Halloween fun! 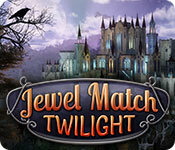 Not trick or treating this year but will have great fun playing Jewel Match's terrific Halloween Treat!!! A must have for holiday M3's!!! 5 fins up!